Due to cutbacks in council and police funding, riot shields are to be replaced with librarians. She ain't heavy, she's my grandmother. "I've rescued the woman from the abusive household. Apparently she was given a dog's life by her husband for years. What's that Sarge? am I going to bring her in? No..no I was just going to put her back in her kennel." "Ello,ello, sarge , just bagged meself a bargain at the boot fair . Yep ,another OAP special!" We can’t let these retired teachers visit their old schools anymore Sarge. When they ask the pupils which is greater 51.9% or 48.1% they get the answer wrong but then demand a second go at the question. The young handsome policeman had unfortunately picked her up badly and his hand was caught between her legs and on her crotch. Sharon was going to pretend to be unconcious for as long as she possibly could. "I've got another Sarg, I'll dump her on top of the other remainers"
"What the hell is going on over there Dave?" 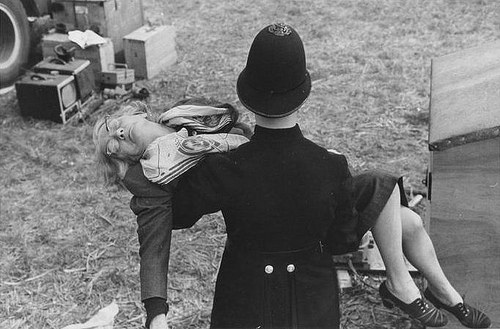 "I'm not sure to be honest, all I can see is a drunk woman with no knickers on and some constable"
It was Help Yourself Day at the Glastonbury Festival. Serg. I've got the Prime Minister here...looks like Corbyn must have agreed something with her. Jane fainted when she viewed the gas prices in Los Angeles. Cop a feel, the Cosby way. "Sarge, I've picked up another Gulliver captioneer"
"She died from a cuffing fit." Gillian McKeith swoons at the sight of PC Plod's truncheon. She only has to look at a police officer and her head goes fuzzy.